KENNEDY SPACE CENTER, FL – SpaceX’s tenth contracted resupply mission to the International Space Station came to a safe conclusion with a splashdown of the Dragon spacecraft in the Pacific Ocean Sunday and successfully returned a treasure trove of more than two tons of precious science experiments and research samples from the space station. Researchers on Earth are eagerly awaiting the science data and samples in order to carry out high powered laboratory analysis that will eventually yield the fruits of the hard won labor – years in the making. The Dragon CRS-10 cargo freighter departed the International Space Station (ISS) Sunday morning after Expedition 50 astronauts Thomas Pesquet of ESA (European Space Agency) and Shane Kimbrough of NASA released the spacecraft from the grip of the station’s 57.7-foot-long(17.6-meter) Canadian-built Canadarm2 robotic arm as planned at 5:11 a.m. EDT, March 19. After carefully maneuvering away from the orbiting outpost and six person international crew at an altitude of appox. 250 miles (400 km), Dragon eased away to a safe distance. The vessel then fired its braking thrusters a few hours later to initiate the reentry burn that would set the craft on course for a fiery plummet through the Earth’s atmosphere. Some five and a half hours later the spaceship carried out a parachute assisted splashdown in the Pacific Ocean at 10:46 a.m. EDT, about 200 miles southwest of Long Beach, California. The highest priority research and technology cargo will be removed from Dragon immediately and returned to NASA. The rest will travel back to port and be prepared for a return trip to SpaceX’s test facility in McGregor, Texas, where the remaining scientific samples, research experiments and technology gear and hardware will be unloaded for NASA. Dragon had spent nearly a month berthed at the Earth-facing port on the station’s Harmony module, since arriving on Feb 23. 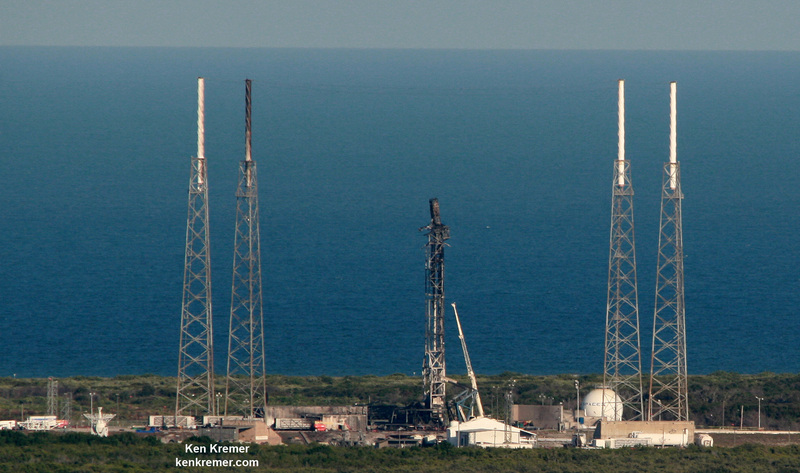 Dragon begun its space voyage after it was launched from the Kennedy Space Center (KSC) on Sunday, Feb. 19 on the first Falcon 9 rocket ever to blast off from historic launch pad 39A in a blaze of glory – as I reported here. At liftoff, the Dragon CRS-10 space freighter was carrying more than 5500 pounds of equipment, gear, food, crew supplies, hardware and NASA’s Stratospheric Aerosol Gas Experiment III (SAGE III) ozone mapping science payload to the low Earth orbiting station in support of the Expedition 50 and 51 crew members. After a four day chase, Dragon was captured and attached to the station using the Canadian arm on Feb 23 by the same two astronauts who released it on Sunday. SAGE III will measure stratospheric ozone, aerosols, and other trace gases by locking onto the sun or moon and scanning a thin profile of the atmosphere. It is one of NASA’s longest running earth science programs. The LIS lightning mapper will measure the amount, rate and energy of lightning as it strikes around the world from the altitude of the ISS as it orbits Earth. Its data will complement that from the recently orbited GLM lighting mapper lofted to geosynchronous aboard the NASA/NOAA GOES-R spacecraft instrument. NASA’s RAVEN experiment will test autonomous docking technologies for spacecraft. SAGE III and RAVEN were stowed in the Dragon’s unpressurized truck. Astronauts plucked them out of the trunk using the robotic arm and attached them to specified locations on the stations exterior to carry out their objectives. For the return trip to Earth, the astronaut crew loaded Dragon with more than 5,400 pounds of NASA cargo, and science and technology demonstration samples gathered and collected by the stations crewmembers. “A variety of technological and biological studies are returning in Dragon. The Microgravity Expanded Stem Cells investigation had crew members observe cell growth and other characteristics in microgravity,” said NASA. Dragon departed in order to make way for the arrival of the next cargo ship. The ‘SS John Glenn’ Cygnus cargo freighter built by Orbital Sciences is due to lift off no earlier than March 27 on a United Launch Alliance (ULA) Atlas V rocket from Cape Canaveral Air Force Station. Watch for Ken’s onsite launch and mission reports direct from the Kennedy Space Center and Cape Canaveral Air Force Station, Florida.